Cameras – almost every news story these days has some kind of footage paired with it. Whether it is a bank robbery, police action shooting, or a Bigfoot spotting – cameras are there. This especially holds true for vehicle dash cams, and they can be an invaluable piece of evidence if you are ever in a car crash. In-vehicle dashcams are still a somewhat new addition to a vehicle for the average consumer. However, with the ever-rising number of police shootings that are oftentimes heavily scrutinized, road-rage incidents, distracted drivers, and so on, having an indisputable witness staring out of your windshield at all times is clearly becoming more and more of a needed adjunct to everyday living. PAPAGO! 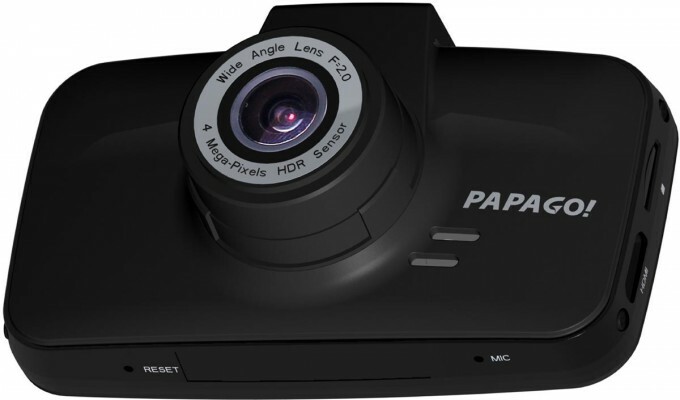 offers a wide variety of video recording devices in a number of form-factors. Today we are looking at the PAPAGO! GoSafe 520, a small form-factor dashcam that touts specs at a price point that demand it be taken seriously. How did the PAPAGO! GoSafe 520 fare? Let’s take a look at the device that is always watching. The GoSafe 520 is small for a dashcam with as many features as it brags. 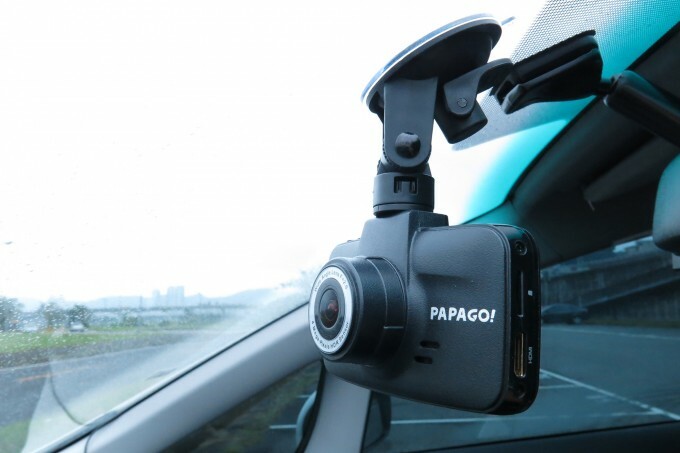 The last Dashcam that we reviewed was the PAPAGO! P2 Pro. When you compare the sizes of the two units, the P2 Pro is much thicker than the 520, and you can credit the GPS module in the P2 for that. The GPS tracks things like your vehicle speed, map coordinates, and puts that on the video readout if you like, but the 520 does not offer this, making its super-slim form-factor possible. The front of the unit is clean and simple, a camera lens placed front and center, a small logo to the side, and that is about it. On the left-hand side you find the slot for the Micro-SD card and the mini-HDMI out. This output, likely because of how thin the unit is, would likely not afford the size needed for a full-size HDMI. I see this as a non-issue, as adapters from mini-HDMI to standard full-size HDMI are easily had, and quite affordable. On the right-hand front side of the unit you find the menu and navigation buttons. The camera comes with a nicely-made suction-cup windshield mount, and a car charger. I found the mount to be better than most I have ever used, as it stayed put no matter how hot/cool the inside of my car got. The front LCD screen has a resolution of 960×240. Unlike some models, this actually has an internal Li-Polymer 420mAh battery. You won’t be recording hours of footage on a single charge, but it is enough for regular use. The power supply that comes with the camera is a standard 12-24v 1.5A rating, and plugs into a standard vehicle power port. The voltage is stepped down to 5v, and the connection to the camera is a mini-USB, making your power options a little more diverse – not being married to a proprietary connector that the manufacturer used. Personally, I found the aspect ratio of 21:9 to be the best possible option, as having the wider field of vision is more advantageous in my opinion, than having 60FPS but a more limited field of vision. The video codec is H.264; MOV format. This is not my personal favorite format, but hey – it works, and is playable by most all video players these days. The onboard storage slot is a Micro-SD slot which can support class 10 and higher cards (UHS1), and could hold up to a 32GB size card, but thanks to a recent firmware upgrade, it now can use a 64GB Micro-SD card. PAPAGO!’s website claims that some brands may not be compatible, and even mentioned SanDisk by name, but I had no issues whatsoever with my SanDisk Ultra 32GB card. It should be noted that a high-speed SD card is required for full-resolution recording. The video output supports HD output, PAL or NTSC. The on-board menus offer English, Traditional Chinese, and French. The operating temperature ranges from -10°~65°C, which should be just fine in any car in America. This model sports the single-most important feature a dashcam can have in my opinion, that is UltraWHD 21:9 video format, which is 2K motion-picture format, 146 degrees of view. This gives you an incredibly wide view, giving you the ability to capture as much of what is happening in front of you as possible. This format can be changed to any of the other formats that I mentioned earlier, and the other offerings are indeed nice, but I can’t imagine not using the widest possible setting – after all, you are using this to capture events that might happen, not shoot a movie. The GoSafe 520 automatically adjusts its EV (Exposure Values) to capture the highest quality video, whether it is dark or light outside. This unit also sports a built-in G sensor (gravity); this will detect when you have been in a collision, make hard or very sharp turns, or drastic braking, and write-protect the video just before, during, and after the sensor detects a problem. Let me explain why that is important. Let’s say someone runs a red light and side swipes your car – you crash into a ditch, and are knocked unconscious. The paramedics come and cut you out of the car, and take you away in an ambulance. Several hours later, a wrecking company comes and gets your car out of the ditch, and all this time your dashcam has been recording. Without the G-sensor to write protect the video, you might lose that critical, damning evidence against the other driver showing that the crash was not your fault. Dashcams are made to automatically overwrite the oldest file on memory, as to not fill up the storage device. The camera makes all of your video into 3-5 minute files, and once the card begins to fill up, the camera will automatically overwrite the oldest files on hand. The G-sensor will write-protect the crucial files that were active at the time of the crash, so they can’t be accidentally deleted. Another feature that is certainly worth noting is the 520’s the ability to start recording when motion is detected – this could be invaluable if you park outside or on the street. Now if there is a hit and run, you can refer back to your footage and give that to the police. One feature that is offered is a stop and go alert. Thankfully this can be turned off, as I personally hate features like this. The way it works is if you are stopped for more than 10 seconds, and the car in front of you starts to go and you don’t, it will give you an audible charm-like alert, in case you are not paying attention. Useful at traffic lights, not so useful in a traffic-jam. Another feature that I quickly turned off after trying out, was the driver fatigue alarm. This causes the 520 to beep when you move around in your lane too much. It seemed to work as designed, and I was able to trigger it by drifting around; this is another one of those features I don’t care for, but might be good if you are a parent getting ready to send a teenager out on the road! I used this camera every single day for quite some time, and it quickly became a part of my vehicle, and it easily becomes one of those “set and forget” items. The menus are simple and well thought out, and you can quickly become a regular expert at operating this dashcam. As I mentioned before, the form-factor is small and unobtrusive; it is very easy to just let this device blend into your windshield and be forgotten. There is a menu feature that allows you to have the LCD display turn off after one minute. I enabled this, as I found the ever-running LCD to be a little distracting. The video that this camera shoots is not movie theater quality – and it is not fair to think that it will be, no matter what your expectations are. This is, after all, not an entertainment piece meant for capturing memories; this is meant to be an eyewitness to an event that you would otherwise rather forget. I found the video quality to be acceptable, and the super-wide viewing angle the single-most important feature that this camera can offer. Night-time video isn’t perfect, but night-time video has always been a sticky thing to master, and this camera does not master it; it does a good job at this price point, though. All in all, I am impressed with this camera, and I would recommend anyone who does any amount of driving to have one in their car. They are a small investment that could pay for itself the first time you make an insurance claim; one that you would have had to pay a deductible on (hit and run, for example) but don’t have to, thanks to your eye-witness with its high definition video. Some people might pass up this model for one that offers GPS, and at first, that seems like a fair argument for passing on this model. With the size, weight, and cost that you save by not having GPS, I think it is a good trade-off. The GPS coordinates and speed being displayed on the screen is great, but if you do ever have to use your footage in court, it would not be difficult to prove that the occurrence in your video happened where you say it happened, and speed is not difficult to calculate either. 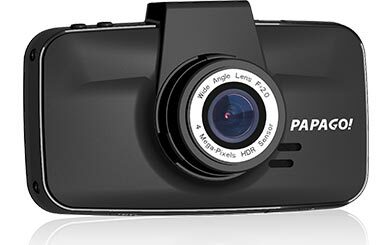 If you ever wonder if you should have a dashcam in your vehicle, I encourage you to go to YouTube and search for “road rage” “car crashes”, it certainly made an impression on me, and I find a great deal of comfort knowing my $159.00 dashcam is always looking out for me. Slim, low profile form factor. No GPS, but this isn’t a big deal. Would like to be able to accept full-size SD cards.